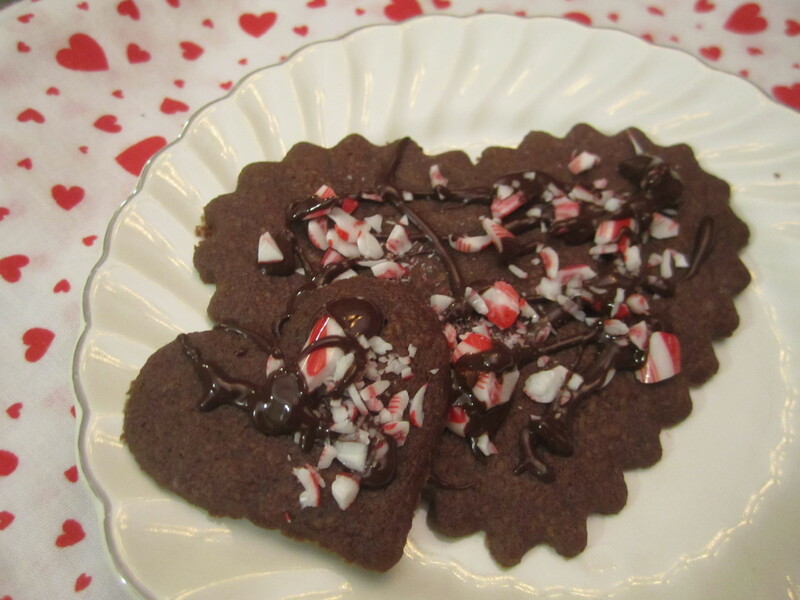 It’s my tradition to bake heart-shaped cookies on Valentine’s Day (or before, as the case this year) and this year, I adapted a Christmas cookie recipe. I’d had it out in my recipe pile since Christmas, and was glad to get out my 3 heart-shaped cookie cutters and make them. I’ve also posted a delicious cherry brownie recipe I made recently to bring when we visited family. They were a big hit! Sift flour, cocoa, and salt into medium bowl. Beat butter and sugar in large bowl until smooth. Beat in vanilla. Add dry ingredients; beat until dough holds together. Divide dough in half. Shape each piece into disk. Wrap in plastic; chill until firm enough to roll, at least 45 minutes and up to 1 day. You will need to let the dough sit out to soften a bit before you roll it. Set rack in center of oven and preheat to 300°F. Roll out 1 dough disk on floured surface to 1/4-inch thickness. You will most likely need more flour on your surface and to keep the dough from sticking to your rolling pin. Using heart-shaped cookie cutters, cut out cookies. Transfer to sheets, spacing 1 inch apart. Gather scraps into ball. Wrap; chill until firm, about 30 minutes. Stir chocolate in small metal bowl set over saucepan of barely simmering water until smooth. 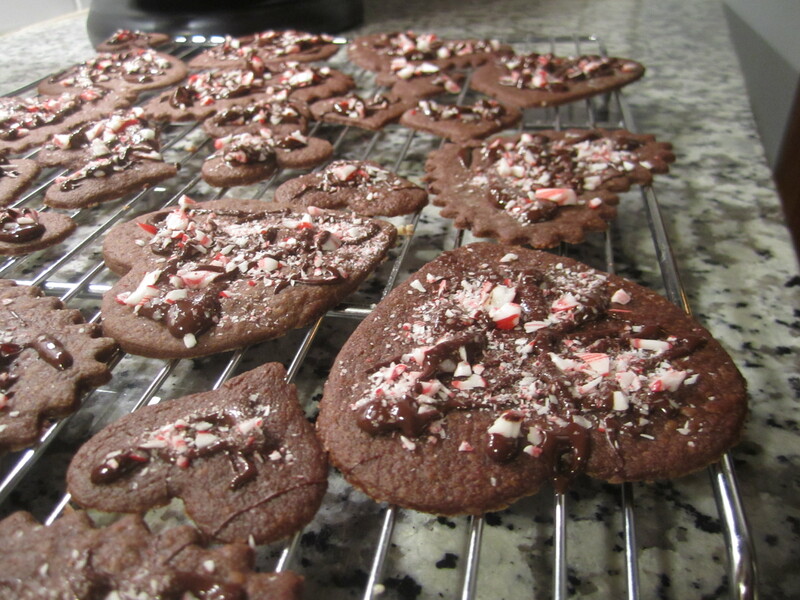 Using small spoon, drizzle chocolate over cookies in zigzag lines. Sprinkle with crushed candies. Drizzle remaining chocolate over. Let stand until chocolate is set, at least 1 hour. Do ahead Can be made 3 days ahead. Store cookies between sheets of waxed paper in airtight container at room temperature. Preheat oven to 350 and grease a 9 by 13″ pan. Melt butter and chocolate together in a medium saucepan over low heat. Whisk in sugar, brown sugar, eggs and vanilla, stirring 2-3 minutes. Stir in flour, baking powder, salt and jam. Pour batter into pan and bake for 40 minutes or until the brownies begin to pull away from the sides of the pan. Allow brownies to cool before cutting. Enjoy!